45% of health tourists from abroad and 30-40% of domestic health tourists. Recently the Seychelles President visited India and visited some of the hospitals in Chennai and expressed his opinion and was delighted to see that the Seychelles people visiting India for medical and health care are treated well in India. He said �I am happy that our people come here for treatment. They are treated with very good care and compassion and we shall continue to see how we can further expand the cooperation�." Even the foreign investors rate Chennai as the city with the best infrastructure facilities in India. The same is true for the medical and health care facilities in the city. Apollo, Vijaya and Shankar Netraylaya are some of the top rated hospitals in Chennai catering to both domestic and foreign patients. •	Team of Surgeons who have collectively 5000 successful surgeries to their credit. 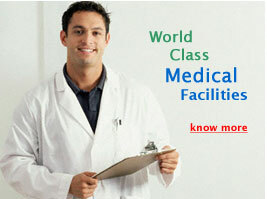 •	World class hospitals equipped with the latest medical equipments and facilities. •	Five star hotels to offer you luxury accommodation. •	24 hour multilingual help desk, speaking your language. •	Facility to offer food of your choice. •	Internet, fax and telephone facility in the room. Leading Indian hospitals in Chennai cater to the following facilities like Cardiology and Cardiothoracic Surgery, Joint Replacement, Oorthopedic Surgery, Gastroenterology, Ophthalmology, Transplants and Urology. The Apollo Hospitals also provide services like Neurology, Neurosurgery, Oncology, Ophthalmology, Rheumatology, Endocrinology, ENT, Pediatrics, Pediatric Surgery, Pediatric Neurology, Urology, Nephrology, Dermatology, Dentistry, Plastic Surgery, Gynecology, Psychiatry, General Medicine and General Surgery. Other services like General Radiography, Ultra Sonography, Mammography and Angiography.